Last Friday, in the spirit of the idea that learning a new language should be a culturally immersive experience, my school threw a Halloween party. Halloween is not traditionally celebrated in Indonesia, obviously, but everyone figured this would be a great excuse to get some kids to practice their English while wearing face paint and trying not to step on coconut jack-o'-lanterns. The "party" was actually an English competition, for which students were invited to write original ghost stories and perform them, in full costume, before a panel of native English speaking judges -- including, of course, yours truly. It was a very enjoyable evening on the whole, as any evening spent observing Indonesian college students dressed up in white sheets and fake blood running around screaming "IT IS GHOST! AHHH!" while one's own colleagues, dressed all in black, giggle on the sidelines in full white face make-up should be. While I had been plugging the "Goshy Skits Competition" hard in all of my classes over the preceding few weeks, only one out of the twelve groups who performed were made up of students of mine. (Also, I never quite figured out how the misspelling of "ghosty" as "goshy" made it all the way from the initial draft of the flier to the ten-foot banner hung behind the stage ... but hey, who's counting?) Clearly this was the Dream Team, however, as became apparent once the two other judges and I tallied up our scores at the end of the competition to identify the winning group as ... my students. (And before you skeptics start wondering if I stacked the cards, let me be quite clear: this group received the highest number of points from both me and one of the other judges, and the second highest number of points from the third judge. So when we added it all up -- well, you can do the math.) Recognizing that it might look a little weird if my own students received first place, I briefly considered suggesting to my fellow judges that we dismiss the numeric score and award them second place instead, but then I figured -- screw that, they earned it. It's not my fault if I have the best damn students in the whole damn school, now is it? NOT stacking the cards turned out to the be right choice. After the winners were announced and the prizes were awarded and the lights came up and everyone felt they could finally rub their eyes without worry of mussing their face paint, I went over to my students to congratulate them, and found that they were positively beaming. They were giddy and golden and falling all over themselves trying to express to me how excited they were to have won first place, how much of a long shot they had considered it to be. One of the girls even had tears in her eyes. It was like they'd just won an Olympic gold medal, and suddenly this haphazard and handmade language competition in an old conference room on the third floor of a little university building in Indonesia became a huge deal, the winning of which was something to be seriously proud of, and something to remember for a long time. As I posed for the requisite photos-with-the-teacher, it was all I could do to hold my own tears in check. Jeez LOUISE these kids are great. This sentiment was confirmed tenfold this past Monday, when, a few minutes before our General English class was due to start, three of these students came in to the classroom carrying a black plastic bag and informed me that, "Miss Fiona, we have a present for you!" Aw, a thank-you present. Could this get any more adorable? Actually, it could. I opened the bag and proceeded to (literally) shriek with delight. Turtles. Two tiny turtles in a little tiny turtle tank. Actually, it just did. The turtles, it seems obvious, are a reference to my tortoise shell tattoo, which has been a continuous source of intrigue for my students over these first few months of teaching. (I made sure to wear a long-sleeve shirt to the first meeting of each of my classes -- gotta establish the teacher-student dynamic, dontchaknow -- but noticed that for the first few classes after I started wearing my sleeves rolled up, I could literally trace some of my students' eye movements as matched exactly the movement of my right forearm. Hilarious.) I can't remember if I've mentioned to these particular students the meaning behind my tattoo and why the desert tortoise, specifically (but also turtles in general) are my favorite animal, but either way, it was among the more sweet and thoughtful gifts I've ever received. I love my students. I love my students. I love my students. The gift of a house pet, however, is a gift that comes with much responsibility, and after giving the issue some serious thought, I realized that I pretty much have my hands full caring for just one form of animal life (i.e. my own) and that at this point I'm not sure I could really take on two more. (The sight of these little guys in their little tank also unsettles me and makes me vaguely sad, but that is neither here nor there.) Anyway, it took me exactly twenty-four hours to find the turtles a new home -- my housemate Queeny, who teaches Chinese at an elementary school, is going to bring them to her kids to be their class pets. Adorable. And while it makes me kind of sad to see my turtles go, I know that what I appreciate most about having received them is the meaningful gesture from my students, and that's the part I plan to hold on to -- I don't need to keep two little animals in a cage to remind me of that. Besides, there's a classroom full of seven-year-olds who will be wanting their very first communal reptiles. 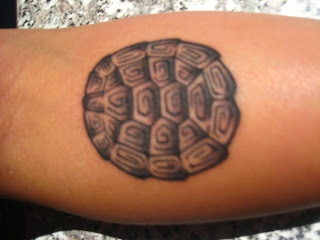 What is really special to me about turtles/tortoises -- and the idea that is behind my tattoo -- is the concept of home. The concept of carrying one's home on one's back is very sacred to me, and is, in my view, something to aspire to. To carry your home with you wherever you go means that you will always BE at home. And while I don't yet feel that Indonesia is home -- and, realistically, may not ever get to that point -- I do recognize and embrace that it is my home for now, because I am here. By virtue of being where I am, in other words, in a certain way, I'm home. At least, that's how I'm choosing to look at it. And also, for the record, I have the best damn students in the whole damn school. I really enjoyed this article. Not only am I heavily tattooed, and understand that there are quite a few cultures enamored with my western body modification, but I also consider turtles to be an all time favorite animal. The craziest thing was finding this article in Google Image searches for turtle tattoos. I've thought about getting the turtle, but my power animal is the arachnid in all its splendid glory. I'm also homeless, and in being so am always carrying my home on my back. I'm seriously reconsidering getting that turtle now...Thanks.